Newton, Conn.: Taunton Press. Fine in Good dust jacket. 1982. Fifth Printing. Hardcover. 0918804027 . HC/DJ - fine/good. 5th printing, 1982. Hardcover itself is clean and unmarked, with little to no wear. B/w illustrations. Dustjacket has age tanning and several small edge tears, small chip from spine bottom, flap flap is clipped. 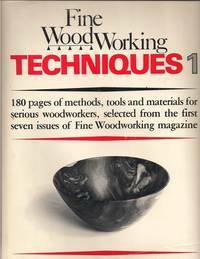 180 pages of methods, tools and materials for serious woodworkers, selected from the first seven issues of Fine Woodworking magazine. 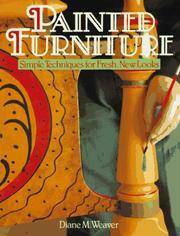 Includes: choosing wood, workbenches, gluing, carving tools, mortise and tenons, finishing, shaper knives, marquetry, polishing, drying lumber, turning bowls, carcase joints, building a dry kiln, dovetail joints and several other topics. (1095-0514) ; 4to 11" - 13" tall; (note: due to heavy weight, extra postage will be required to most locations. Contact us for exact quote) . U. K.: Guild of Master Craftsman Publications. Good. 1999. First Edition. Softcover. 186108126x . Ex-library book in good used condition - sturdy laminated cover and usual ex-lib type of markings. Light soiling/spotting to outer edge of pages, and some spotting to a few pages near rear of book, otherwise clean and intact. Light scuffing to covers. Illustrated in colour and b/w. ; 8vo 8" - 9" tall; 160 pages; Based on the authors classic Stick Making: A Complete Course, this concise introduction is made for the beginner. From cutting and seasoning sticks to decorating and dyeing, every aspect of this traditional craft is covered. Learn safe heating practices on a thumbstick; try out coloring techniques; and use alternative materials like rams horn along with wood. A color gallery shows off sticks, crooks, and canes. Chip Chats. (315osl, 0711) . Crowood Press. Good+. 2001. First Edition. Softcover. 1861263759 . Ex-library book, but still in good condition - sturdy laminated cover and usual ex-lib type of markings. Pages are intact and clean other than some small stains inside front cover, a little moreso inside rear cover. These appear to be a type of glue residue. No pages are stuck together. Overall wear is otherwise very light. Illustrated. 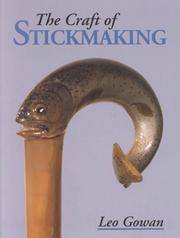 ; Large 8vo 9" - 10" tall; 96 pages; The traditional craft of stickmaking is "popular" in the truest sensethe necessary skills can be acquired without too much difficulty, the tools are minimal, and the materials are readily available. 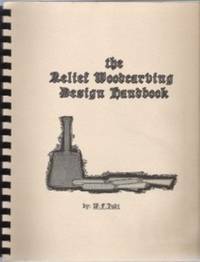 This complete guide, which will appeal to novice and craftsman alike, ranges from the basic techniques through to the carving of intricate handles. 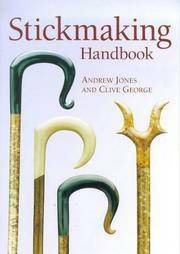 Covering a wide variety of raw materials and types of stick, The Craft of Stickmaking is illustrated throughout with clear photos and drawings. Leo Gowan, a professional stickmaker, is also the author of Stickmaking. (350osl, 0211) . Lark Books. Very Good+. 2008. First Edition. Softcover. 9781600590351 . Ex-library book, but still in great condition - laminated cover and usual ex-lib type of markings. Pages are clean and intact, cover has light scuffing and a little wear at corners. Colour illustrations. 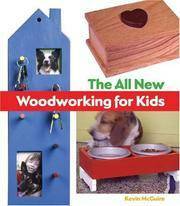 ; 4to 11" - 13" tall; 144 pages; The All-New Woodworking for Kids takes an already popular book and gives it more: more projects children will love and more information in an expanded introductory section on tools, materials, techniques, and safety. Plus, this invaluable guideone of the rare woodworking volumes created especially for kidshas been completely redesigned with thoroughly contemporary photographs. Of the nearly 40 projects included, 15 are brand-new and 25 have been redesigned. So now its even easier and more fun for kids to handmake a bench for their own workshop, create a DVD storage cube that spins, build a doggie diner, or craft adjustable stilts, a box with a secret drawer, and many other long-lasting items. (530, 0211) . Sterling. Very Good. 1996. First Edition. Softcover. 0806942878 . Ex-library book, but still in very good condition - sturdy laminated cover and usual ex-lib type of markings. Pages are clean and intact. Cover has light scuffing and light wear to edges of laminate. Includes 30 projects, personally chosen as a favorite of the creator. Each one is explained by the designer, along with detailed instructions, a color photo of the finished work and line drawings for assembling the parts. (520) ; Large 8vo 9" - 10" tall; 144 pages . Sterling Pub Co Inc. Very Good. 1994. First Edition. Softcover. 0806982489 . Ex-library book, but still in very good condition - sturdy laminated cover and usual ex-lib type of markings. Pages clean and intact, a little soiling to outer edge of pages. Cover has light wear at spine ends and a few small tears to laminate along spine area. ; Large 8vo 9" - 10" tall; 144 pages; Characterized by elegant circular features and gentle curves, Shaker designs are best created using a band saw. 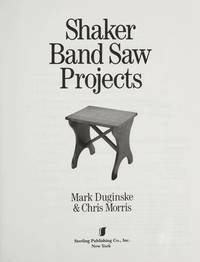 Mark Duginske, band-saw craftsman and Shaker designer, has arranged these projects in order of complexity. Designs include a hanging shelf, benches, tables, chairs and cabinets. Everyone from the beginner to the experienced band-saw user should find appropriate projects amongst this collection. (415osl, 0211) . 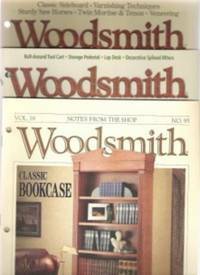 Popular Woodworking Books. Very Good. 1998. First Edition. Softcover. 1558704620 . Ex-library book, but still in very good condition - sturdy laminated cover and usual ex-lib type of markings. Pages are clean and intact, light soiling outer edge of pages. Laminate on cover has light wear at corners. B/w illustrations. ; 4to 11" - 13" tall; 120 pages; A well-planned production run is the key to saving time and money. This guide takes woodworkers into the shops of several successful professionals to give them an o ver-the-shoulder perspective on the business of running a great home shop. (483, 0211) . Guild of Master Craftsman. Very Good. 2001. First Edition. Softcover. 1861082304 . Ex-library book, but still in very good condition - sturdy laminated cover and usual ex-lib type of markings. Pages clean and intact, slight soiling outer edge of pages, minor wear to laminated edges on cover. Illustrated in colour. 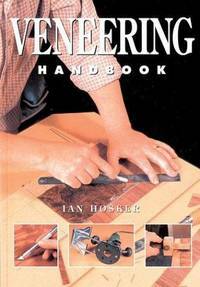 ; 8vo 8" - 9" tall; 144 pages; A concise introduction to veneering, the craft of affixing a thin layer of wood to a substrate. An excellent instructor, Hosker shows readers which materials and equipment are required and explains the most commonly used techniques: cross-banding, bookmatching, inlaying, and parquetry. 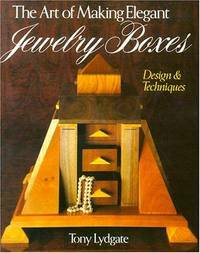 Recommended for all public library woodworking collections.  (290osl, 0211) . By Upton, John; Tangerman, E. J. Sterling Publishing Co., Inc.. Very Good. 1985. Softcover. 080698788x . 1985 reprint. Pages clean and unmarked, all intact. Cover has some scuffing, light edge rubbing, edgewear, old price sticker on rear. 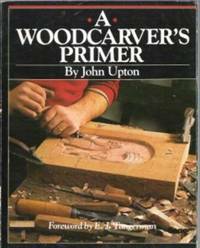 Learn to carve from master wood carver John Upton. Includes: types of wood to use; tools; setting up the work area; designs and techniques; complete projects with over 225 photos; glossary of technical terns. (370-0sl) ; Large 8vo 9" - 10" tall; 156 pages . Grande Prairie, AB: W. F. Judt. Very Good. 1988. First Edition. Plastic comb binding. B0012JPE86 . Self-published 1988. Plastic comb spiralbound. Very nice condition. Pages clean and unmarked, printed on one side only. Cover has light wear at corners and slight soiling of cover and outer edge of pages. Main Headings: Design principles; Borders; Theory behind the use of Bevels; Good Bevels vs. Bad Bevels; Figure and grain as design components; Landscape as a design component; Background options; Text as a design component; Methods for producing accurate drawings; Layup of wood; Finishing alternatives and Sources for design ideas. (386-osl? ) ; 4to 11" - 13" tall; 42 pages . 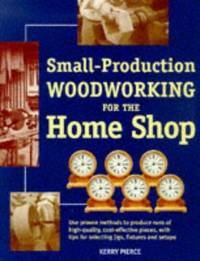 Popular Woodworking Books. Very Good. 2000. First Edition. Softcover. 1558705686 . Former library book, still in very nice condition - sturdy laminated cover and usual ex-lib type markings. Pages are clean and tight, one library stamp is marked out on top edge of pages. Cover is clean, with light scuffing and light wear at corners. 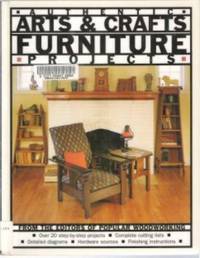 Includes complete instructions for: Morris chair; Box spindle chair & side table; Inlaid Limbert rocker & bookcase; several Greene & Greene pieces; Octagonal Taboret; Stickley side table; Byrdcliffe wall cabinet and others. ; 4to 11" - 13" tall; 127 pages; Review: "With its straightforward lines and rich finish, arts-and-crafts furniture nestles well into any design style. Yet that is not its only appeal. Hordes of collectors, beginning in the 1970s, snatched up every signed and nonsigned period piece at auctions, flea markets, and antique stores. So, with ever-escalating prices, what is an admirer to do? Obviously, the editors of Popular Woodwork ing are convinced that any crafter, even those with minimal skills, can successfully complete one of the 20-odd projects. Introduced by historical notes and excellent instructions on mortise and tenon construction (square pegs fitting into square holes) , each of the patterns, from a Morris chair to a Greene & Greene patio table, includes encouraging details such as plenty of pictures and text as well as information about saving money on lumber and aging steel hardware with gun blue, among other topics. A well-planned and well-executed crafts book. " (566) . Fox Chapel Publishing. Very Good+. 2003. First Edition. Softcover. 1565232151 . Ex-library book, but still in very nice condition - sturdy laminated cover and usual ex-lib type markings. Pages clean and tight, cover has light scuffing and light wear to edges. Profusely illustrated in colour. 74 pages. 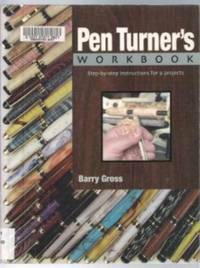 ; 4to 11" - 13" tall; 74 pages; In-depth instruction and creative ideas for both the novice who has never made a pen and the experienced turner looking for a fresh approach are detailed in this book. From choosing a mini-lathe and turning tools to mastering pen turning basics, and from choosing woods and alternative materials to marketing finished work, everything woodworkers need to know to complete a practical and beautiful custom pen is detailed. Step-by-step instructions are provided for making a variety of pens, including a box elder comfort pen, a birds eye maple rollerball pen, a maple burl click pen, a Lacewood Cigar Pen, a pen out of polygem, and a roller-ball-style pen made out of wood and corian. Each step is accompanied by a color photograph and instructional caption. (423-osl) . Sterling. Very Good. 1996. First Edition. Softcover. 0806908408 . Pages clean and tight, light soiling to outer edge of pages. Cover has light edge/corner wear and a little corner curling. Profusely illustrated in colour. ; 4to 11" - 13" tall; 160 pages; "It is almost impossible to look through this book and not want to start painting immediately. The colors are delightfully different from what is usually shown in project books for painted furniture. The best part is the project actually turns out like the picture, even if you are trying this craft for the first time. " (575) . Woodsmith Corp.. Very Good+. 1995. Magazine. Very good condition, clean, no markings, light wear and small creases at corners, 3-hole punched for binder. Contents: Classic arched-back porch swing, hall mirror, making jigs & fixtures, handy tool tote, mortise & tenon - step-by-step. (*shipping will be reduced after checkout on this lighter item) [125-osl] ; 4to 11" - 13" tall; 35 pages . Woodsmith Corp.. Near Fine. 1994. Magazine. Excellent condition, clean, no markings, a little wear at corners, 3-hole punched for binder. Contents: Country Hutch - knotty pine; Note board to fit calendar; accent carving; sanding tips, finishing cabinet - roll-around; circle sanding jig. (*shipping will be reduced after checkout on this lighter item) [125-osl] ; 4to 11" - 13" tall; 35 pages . Woodsmith Publishing. Near Fine. 1994. Magazine. Excellent condition, clean, no markings, 3-hole punched for binder. Contents: Classic bookcase with simple joinery & knock-down hardware; Cutting board; Assembly tips for cutting board; heavy-duty shop filters; small area shop filters; oil finishes - choosing the right one; fluting jig - decorative flutes. (*shipping will be reduced after checkout on this lighter item) [95-osl] ; 4to 11" - 13" tall; 32 pages . Woodsmith Publishing. Very Good+. 1986. Magazine. Very nice condition, clean, no markings other than mark from sticker removal on front, a little wear at corners, 3-hole punched for binder. Contents: Heirloom baby cradle, magazine rack, Tips - cleaning routed corners, tenons on dowels, fitting tenons & others, Joinery - cutting angled mortise and tenon joints and arched-top panels. (*shipping will be reduced after checkout on this lighter item) [100-osl] ; 4to 11" - 13" tall; 24 pages . Woodsmith Publishing. Near Fine. 1981. Magazine. Excellent condition, clean, no markings, 3-hole punched for binder. Contents: Classic contemporary cabinet/hutch - complete plans; free-form routed box; store-it-all wheel-around shop cart; building glazed doors; joinery - mortise and tenon with concealed rabbit; glass cutting. (*shipping will be reduced after checkout on this lighter item) [45-osl] ; 4to 11" - 13" tall; 16 pages . Woodsmith Corp.. Very Good+. 1995. First Edition. Magazine. Excellent condition, clean, no markings, light wear at corners, 3-hole punched for binder. Contents: classic sideboard, varnishing techniques, sturdy saw horses, twin mortise and tenon, veneering, apothecary cabinet. (*shipping will be reduced after checkout on this lighter item) [125-osl] ; 4to 11" - 13" tall . August Home Publishing. Near Fine. 1998. Magazine. Excellent condition, clean, no markings, 3-hole punched for binder. Contents: Build a hidden compartment storage pedestal, make an updated version of a classic lap desk, add decorative splines to miter joints, roll-around tool cart. (*shipping will be reduced after checkout on this lighter item) [125-osl] ; 4to 11" - 13" tall .